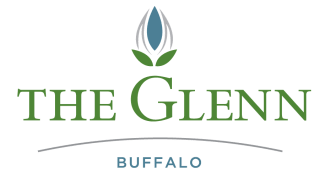 The Glenn Buffalo's Assisted Living community boasts home-cooked meals served in a restaurant-style dining experience, including a daily hot breakfast. There is a private dining room for you and your loved ones to share a special occasion or host a private party. Our Memory Care community creates a home-like dining experience where resident and staff sit together and enjoy homemade food that is reminiscent of the food they enjoyed in their own homes – served family style. Resident community members are encouraged to provide their feedback and suggestions to the culinary team through monthly resident food meetings. Exceptional service and quality meals make dining a nutritious and enjoyable part of each day. For more information on dining, please contact The Glenn Buffalo.